Most of CRF's field work activities are conducted in caves on state or federal lands. Though extensive caving expertise is not a requirement, basic caving skills and some experience is necessary in order to participate in CRF's underground field work. 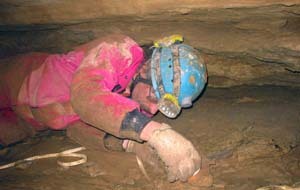 Individuals should have their own caving gear and a basic working knowledge of its use. If you are interested in applying for membership with CRF you will need to provide a short summary of your caving experience and a brief explanation of why you are interested in participating with CRF. If you are interested in becoming involved with CRF but have no underground experience at this time, we suggest that you contact a caving club in your area to get the experience that your need. The National Speleological Society home page lists all of the caving organizations by state along with contact information. CRF activities are not compatible with sport caving in the usual sense. Because Foundation programs have finite needs for field support, and due to space restrictions in field station facilities, the rate at which new personnel are accepted is limited. Researcher Participation: CRF welcomes, supports and encourages researchers who are interested in pursuing projects in any of our operations areas. For more information about research opportunities click here.